Flyers goalie Carter Hart snags the puck during rookie camp at the Skate Zone in Voorhees, on Tuesday. Goalie Carter Hart and center Morgan Frost, the two hotshot prospects who could one day be Flyers cornerstones, say their goal is to make the NHL team in training camp. But both are realistic. Both know they are long shots. Both know they need sensational camps just to be considered to stay with the big-league team. Hart, 20, and Frost, 19, are in the Flyers' rookie camp. They will join the main camp when it starts Friday in Voorhees. When camp opens, the Flyers will have an open competition for the third- and fourth-line center spots. "Hopefully there's a chance for me to make it, and I'm just going to work my hardest and try to win one of those spots," said Frost, who has been noticeably faster than the other players in rookie camp. Frost, who had 112 points and a plus-70 rating for Sault Ste. Marie in the Ontario Hockey League last season, is in his second camp with the Flyers after being selected in the first round (27th overall) of the 2017 draft. "I think there's a different comfortability level," he said. "It's nice to know most of the guys and know the staff and just be comfortable on the ice. It's a little nicer coming back and kind of knowing what's going on." In the OHL, Frost seemed to have a magnet on his stick because he always appeared to have the puck. That won't be the case in the NHL, of course. Frost will have to adjust to playing at a quicker pace and not always dictating the play as he did on the junior level. "It's definitely a lot faster," he said. "I kind of got a taste of that at the end of last season even when I was with Lehigh Valley for the weekend in the playoffs. It's a lot faster. You don't have the puck on your stick as much as in junior, so it's definitely an adjustment and something I'm looking forward to figuring out." Morgan Frost skating at rookie camp Monday. If he doesn't make the Flyers, the 6-foot, 184-pound Frost will have to go back to his junior team because he's too young to play in the AHL. There's an outside chance he will get a nine-game tryout with the Flyers before they have to decide whether to send him to juniors. His entry-level contract would start if he played in a 10th game. General manager Ron Hextall is not fond of a nine-game tryout. His mantra: "If you're good enough to be here, it would be for the full season." If Frost returns to the OHL, some wonder what he could get out of it. Frost, however, said "there's always little things you can improve on … whether it's becoming more of a leader or leading by example. Working on my faceoffs, working below the dots. It doesn't matter where it is, you can always get better. I still have a lot more to improve." 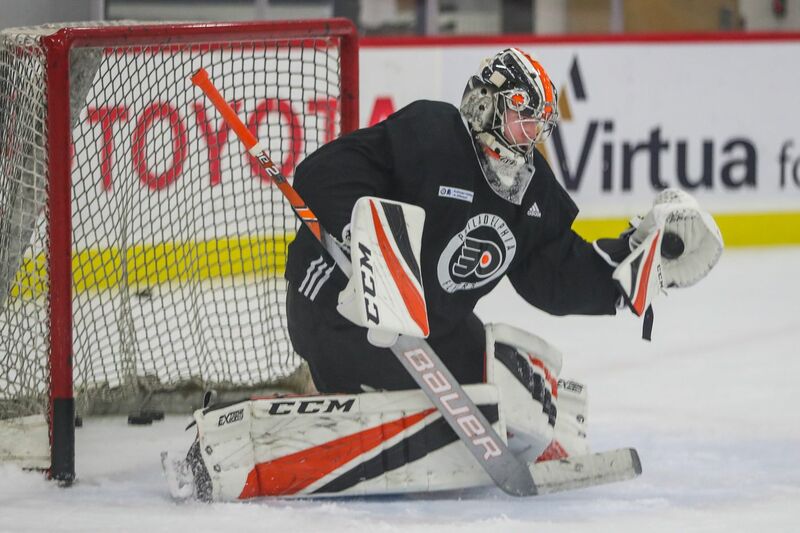 As for Hart, who had a 1.60 goals-against average and a .947 save percentage in the Western Hockey League last season, he is entering his first year in the professional ranks and will likely start the season with the AHL's Phantoms. "For me this year, obviously my goal is to make the NHL, but if that doesn't happen, Lehigh Valley is a great spot," Hart said. "I got to experience that the last two seasons at the end of my playoffs when I went up to Allentown and kind of joined their playoff run. I got to experience that city and what it's about. They have a great setup in Allentown. Either way, I have to make the most of every opportunity I get." Asked if he felt he needed some AHL seasoning before reaching the NHL, Hart said, "I can't really say whether I do or not. I'm here to play, and right now my focus is on training camp and where I'm at right now. Just kind of take things one day at a time and focus on the details I have to focus on so I can perform at my best." The Flyers rookies will face the Islanders on Wednesday at 6 p.m. in East Meadow, N.Y. The game will be streamed on both teams' websites.